Team bye weeks ended last weekend, but because of the extended Thanksgiving schedule of Thursday games, this will be the first weekend in two months we’ll have the complete slate to watch on Sunday. Glorious. Full schedule, almost every game has playoffs implications (sorry Chiefs fans), fantasy football is in the playoffs, college football starts cannibalizing itself fighting over coaches and bowl games, David Beckham and possibly Landon Donovan play their last games with the Galaxy in the MLS Cup*; just listing how great football is in December causes me to hear “It’s The Most Wonderful Time Of The Year” in my head. You’re going to need a hearty snack to get you through the weekend. Even the most adamant Team Pizza fans needs a break from heavy sauce, meat and cheese during the season, but there is nothing quite like tearing into warm dough with a cold beer while watching football. 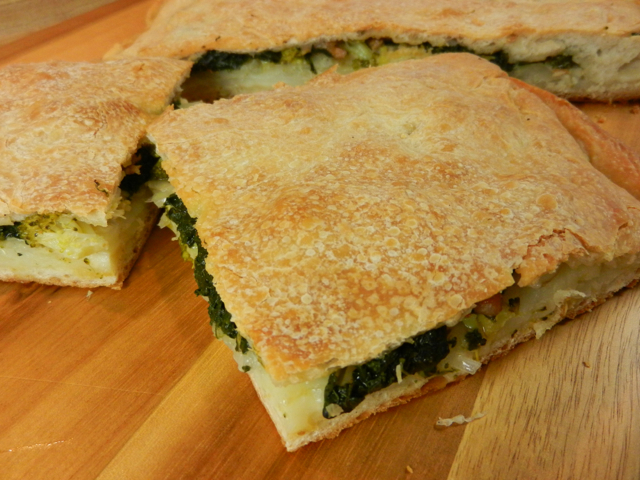 Enter the scacciata, a Sicilian variation of a calzone. Heavy on the vegetables and lighter on the cheese and meat, the layers of favor in a scacciata offer a more complex bite than just your ordinary pizza. Potatoes add heft, shaved onions and fennel play off each other in a sweet and savory delight, spinach and broccoli add brightness, spicy sausage adds heat and depth, while the provolone and a touch of olive oil meld everything together.You can add whatever vegetables you like to a scacciata; peppers, eggplant, but if they are rather watery be sure to cook them down a bit before baking. Want olives? Add olives. Want your scacciata to be even spicier? Sprinkle on red pepper flakes along with the salt and pepper. Second sausage? Sure, but don’t add more than two or it gets too oily during baking. A little sauce? Yes, fine. Just a few dabs here or there. Add too much and you may as well make a calzone. Full post and recipe for scacciata over at KSK. Super easy and great on game dayes. It was a surprise to me that when I Googled “scacciata” the references referred mostly to Middletown, CT. I was born and raised there by my Sicilian family who all emigrated from Melilli, Sicily, its sister city, not far from Syracuse. My grandfather and all his children knew how to make scacciata, and as a kid I thought everyone in the world knew how to make it and enjoy it often as we did. It was only later in life that I learned our heritage was a long and rich one, and we had delicious dishes no-one else had. This is one of them. Sorry, for the slow reply! Yeah, you would think this recipe would have crept out further across the country, but for some reason it hasn’t. It’s very easy to make a great break from red sauce and cheese.